Deputy Minister of Tourism and Creative Economy Sapta Nirwandar expressed optimism that Indonesia will soon become a trendsetter in Islamic fashion as its designers are capable of creating unique and creative works of fashion. 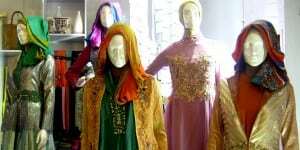 “I am optimistic that Indonesia will be the worlds Muslim fashion trendsetter by 2020,” Sapta claimed here on Thursday. He affirmed that there is a high likelihood of Indonesia becoming a Muslim fashion trendsetter by 2020 as its designs are in demand among the fashion communities around the world. He cited the name of one of the Indonesian designers, Dian Pelangi, who was lately successful in holding a fashion show themed, “Washington Haute and Modesty” in DC Fashion Week, Washington DC, the United States. “Indonesian designs are unique as they are inspired by the traditional cultures,” Sapta pointed out. According to him, if Indonesia gains recognition as the Muslim fashion trendsetter, it will have a positive impact on the economic growth of the fashion industry and tourism sector as there will be many more foreigners visiting Indonesia to keep abreast of the latest trends in Islamic fashion. “Fashion is a soft power to introduce Indonesia through the creative industry,” Sapta stated, adding that fashion is one of the 19 leading sub-sectors of the country’s creative industry. In 2013, the fashion industry contributed Rp181.57 trillion, or about US$1.4 billion. This amount was 28.3 percent of the Gross Domestic Product of the creative economy, which amounted to Rp641.8 trillion, or about US$5.3 billion. The fashion industry in Indonesia provides jobs to 3.8 million people or 32.3 percent of the total workforce employed in the creative economy sector, which is 11.8 million.